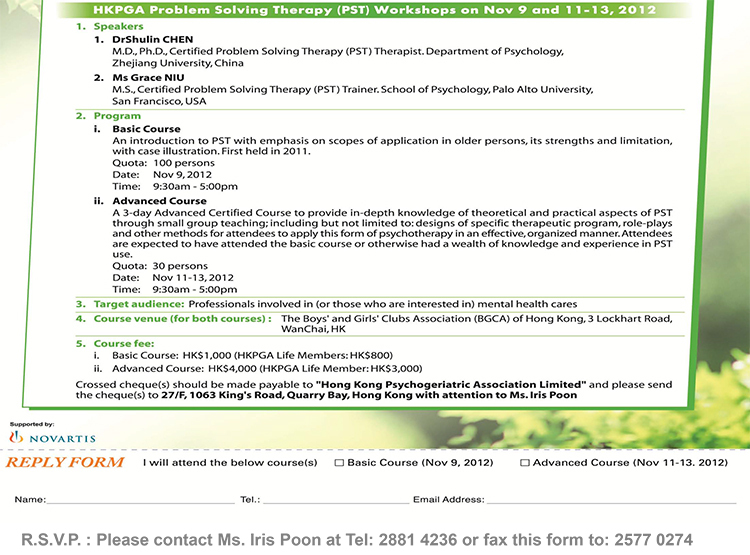 You are cordially invited to join the Hong Kong Psychogeriatric Association (HKPGA) Problem Solving Therapy (PST) Workshops on Nov 9 and 11-13, 2012 and benefit from this specific form of therapeutic tool for elderly depression. The basic course was first held in 2011 and a high number of applicants could not attend because of the limited capacity of the venue; the rerun this year is limited to 100 attendees. And for the new advanced course, it is limited to 30 only. Please refer to the following for further backgrounds about the workshop; intended participants could use the attached form for application via fax. PST is a specialized form of cognitive behavioral therapy and strong evidences back the therapeutic efficacy of this technique in the treatment of a wide range of physical, mental and behavioral disorders (Arean et al, 2008; Bell and D’Zurilla, 2009; Malouff, et al, 2006).In old age, the "depression executive dysfunction syndrome" afflicts a considerable number of depressed elderly patients is associated with resistance towards conventional pharmacotherapy; PST has been shown to be a specific form of psychotherapy that effectively overcome this treatment barrier in elderly (Alexopoulos, et al, 2008). It has been also be demonstrated in a number of studies that it is of superior efficacy over other forms of psychotherapies in late life (e.g. Alexopoulos et al, 2003; Areán et al, 2010) and is comparable to antidepressants in its ability to prevent depression in elderly after cerebrovascular accidents (e.g. Robinson et al, 2008). Through its systematic processes, PST generates a repertoire of effective, adaptive and enduring coping responses towards problematic situations that might otherwise be perceived as impasses in life. PST evolves from a cognitive behavioral model and the ability for effective problem solving has been verified to be both a mediator and moderator in the relationship between stressful life events and mental outcomes. This treatment could be conducted on group or individualized bases. Apply now as again seats are limited! !